Living in the backwoods of rural Oxfordshire, it’s always pleasing when an extreme metal band raises its gnarled head from the murky waters of the River Windrush and proceeds to spray you with distortion, bile and phlegm. 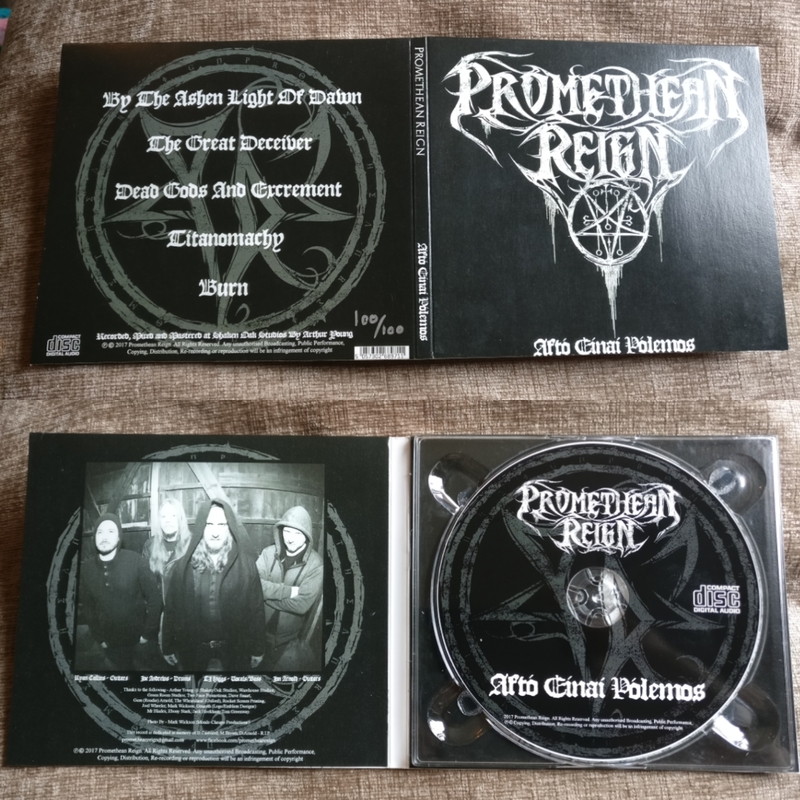 Blackened death metal crew Promethean Reign are the latest band to spawn from the darkest recesses of Witney, releasing only a few pieces of demo material up until this, their debut EP release entitled ‘Aftó Eínai Pólemos’ (translating roughly to an approximation of ‘This Is War’ in English). Opening with a foreboding Emperor-styled synth piece, ‘By the Ashen Light of Dawn’ demonstrates directly what the band are about, by segueing into a feast of slow burning tremolo picked harmonised guitar and double bass drum work. The harshly spat vocals are well enunciated, punctuated with moments of clearly announced oratory pieces, adding to the dark feeling of revenge and hatred the lyrics convey. ‘The Great Deceiver’ features more of the demonic harmonised tremolo picking that At the Gates utilized to great effect in their very earliest of works, before smashing into the ground running with inexorable down-tuned carnage, squealing guitars and barely contained chaotic drum work, leveling landscapes to smouldering remains as they go. ‘Dead Gods and Excrement’ shows no sign of letting up either, whipping up a maelstrom of furious guitars and crashing percussion over embittered vocals, grabbing you by the throat and choking you out for the entire 3 minutes of its run time. ‘Titanomachy’ begins with its foot off the gas, creeping slowly into your psyche with Mayhem-styled shimmering cold guitars, which shape shift into writhing, serpentine riffage. By the time the chorus arrives, it has a rather eastern flavour, which when coupled with bellows of “We Will Rise!”, gives off a strongly triumphant vibe to the proceedings. The EP finishes up on a high with ‘Burn’, a rapturous Morbid Angel-esque stomper which is swathed in dark mysticism, and features some of the best solos and riff work on the EP. Overall, Promethean Reign remind me of a looser, freer flowing Behemoth at times. Perhaps not quite as blasting or immaculately arranged as their Polish brethren, but with a billowing organic fustiness to them that brings to mind many great bands from the Greek extreme metal scene (the fact the EP was recorded live, rather than clinically pieced together on Pro Tools likely helps this). This is the physical release on digipak, limited to 100 hand numbered copies – so if you’re a physical music lover like myself, best to act quickly. This is certainly a promising start for the band, who I’m sure will continue to improve and hone their creative vision to an even sharper point than shown here – good stuff.